Born in Bradford, Paul had started his career as an apprentice at Huddersfield Town in 1985. The left back commanded a £30,000 transfer fee in July 1987, when he moved to Norwich City, before joining Northampton Town in February 1988 for a similar figure. He made some 167 appearances for the Cobblers before going on to play for Halifax Town, Burnley, York City, Scunthorpe United and Cambridge United. 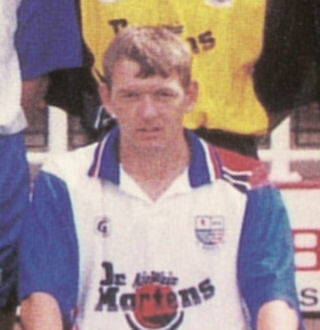 He joined Diamonds in July 1998 after release from Cambridge United and was a regular in the Diamonds side at the start of the 1998 / 1999 season but after a poor performance in the 1-2 defeat at home to Northwich Victoria in October, he was one of the casualties and only made a few more appearances before moving to Aylesbury United in February 1999. He went on to play for Boston United before ending his career at Bedford Town.